An ESRI Shapefile is a graphics file used in GIS programs and have the .shp file extension. These files can include a number of graphic types but we will only be interested in opening Points, Polylines and Polygons (Polylines and Polygons are essentially identical). Each file may be thought of as a group of points or polygons, all with the same pen color and line weight. This will decompress to a folder of GoodShapefiles and here you will find a number of files I've been working with. I am able to open all of these. The Casoli folder includes a set of three shapefiles from Italy. The Damon Oriente folder includes two files from Damon Oriente in Vancouver, Canada. The Stephen Gladfelter folder includes a full set of files from Ohio and Cincinnati. You will be able to import all of the Cincinnati files and the three other files for Ohio. You can also import all of these files, but the files for Ohio are so large that the Cincinnati files will be scaled down to a very small size. You can only see them at the lower left where you will see the red crosses. This is a temporary development program that is a step toward the final goal of the OpenClip Bridge app. It's a 64-bit Cocoa program that will only run with Mavericks or later. I apologize for this limitation and will try to make everything compatible with Snow Leopard and later. 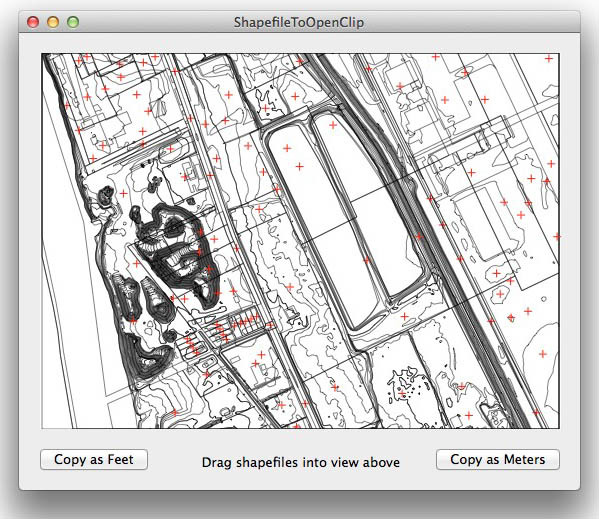 You can drag shapefiles into the view or use the Open command. This will handle polygon and point type shapefiles. Polygons are drawn in black. Points are drawn as red crosses. Malcolm Woodruff sent me some other shapefiles, but they are of a different type (PolygonZ) and not something I want to pursue at this time. You can copy the current view with the Copy as Feet and Copy as Meters buttons. If the files are very large, then this is a slow operation. Wait for the button to return to the normal state. Then you can switch to PowerCADD or FormZ and Paste. While the buttons say Feet and Meters, in fact at this point I have no clue about the exact scale. I'm simply scaling the points to fit roughly on a page about 36" wide, and I'm not doing anything to set the size to feet or meters. This means you'll have to scale things yourself in the destination program. Can now print the view, so Save as TIFF and Save as PDF buttons are gone because you can always print to PDF.